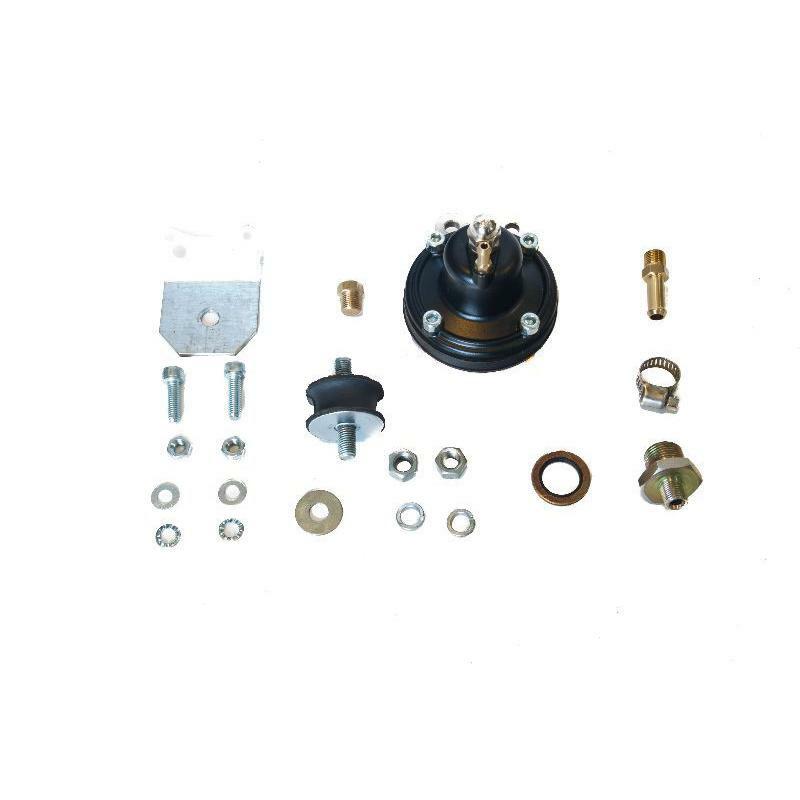 This Pressure Relief Valve (PRV) kit replaces the original PRV found in TR5's and TR6's and as it is of a modern diaphragm design, cures many problems inherent in the Lucas Mechanical Fuel Injection system. 1. This new style PRV is a diaphragm type (the original type operates on the spring loaded plunger on a seat principle) which is not susceptible to resonance; a big problem with the original type valve when used in conjunction with a Bosch fuel pump. The knock on benefit of this is that Teflon (PTFE) lined hose, 215642SS, from the pump to PRV can be used. With the original type PRV installed a hard Teflon lined hose will cause considerable ear deafening resonance so a soft rubber hose must be used. The resonance will go away (hopefully) but as modern fuels will permeate through rubber hose, the boot will inevitably smell of petrol (not popular with the ladies). The use of a Teflon lined hose, through which fuel will not permeate, will radically reduce the smell of petrol in the boot and in most cases eliminate it altogether. 2. To adjust the fuel pressure on the original PRV the return fuel line must be removed as the adjuster is inside the PRV only accessible when this pipe is removed. This means that a real time pressure reading cannot be taken whist making an adjustment as the fuel line needs to be refitted first. This new PRV has an external adjuster which means fuel pressure can be adjusted with the pump running and monitored at the same time. 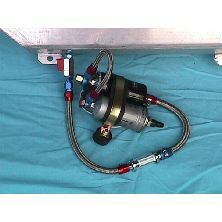 This valve is capable of operating at over 110PSI (7.5 Bar) ensuring it can be adjusted to the correct pressure of 100-110PSI. 3. 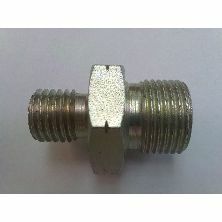 Original style PRV's are usually only available on an exchange basis which is inconvenient especially to overseas customers. As core units are very scarce and new old style PRV's are only spasmodically available we can only occasionally offer the original PRV for sale on an outright basis. As this this new PRV is sold on an outright basis and is readily available this problem is overcome. 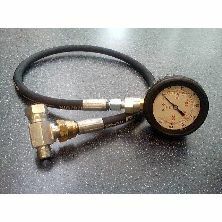 The kit is supplied with full instructions and all the fittings necessary to complete the installation however the pressure will need to be set and a pressure gauge will be required. If a suitable fuel pressure gauge is not available locally, Revington TR can either supply a suitable set outright under part number RTR4007 or hire one out under part number RTR4007HIRE at a much reduced cost. In this case a deposit is charged until the set is returned in serviceable condition. 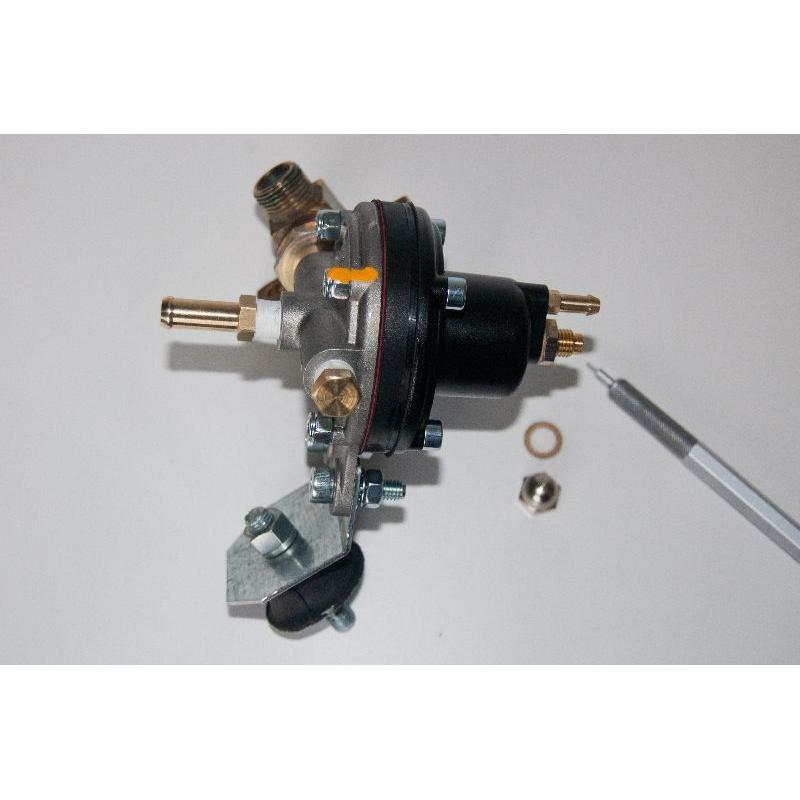 This PRV system is designed for fitment in conjunction with a Bosch fuel pump conversion kit with a micron paper filter AFTER the fuel pump. A typical kit can be viewed on our website. See RTR4050XK below. This PRV kit will not fit with a Lucas fuel pump unless the pipework is reconfigured so that the PRV is moved out of the way of the CAV filter and its pipework. 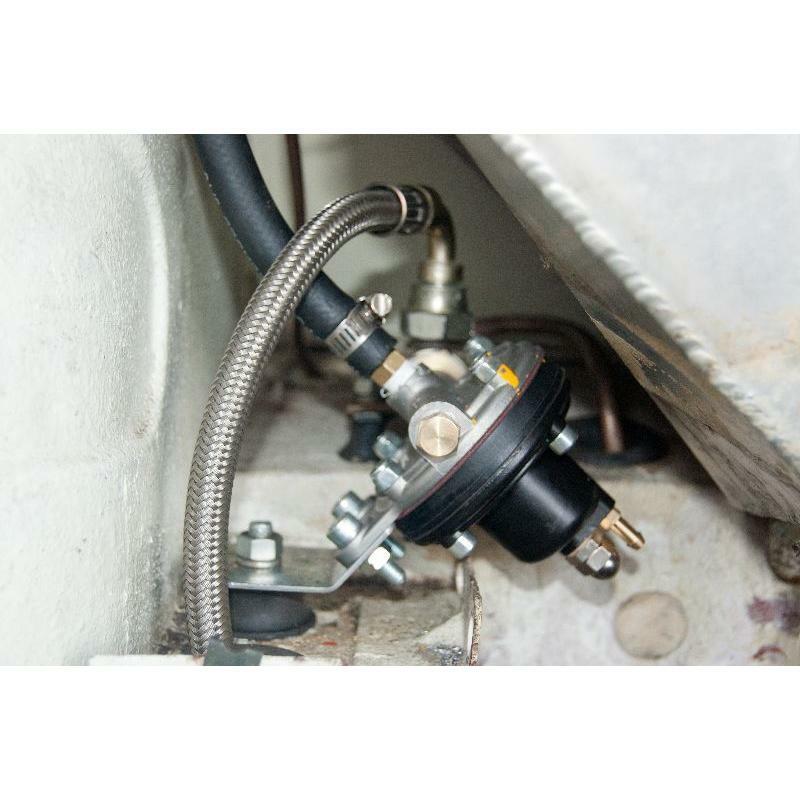 TR5 owners with the PRV on the chassis are strongly advised to reengineer the pipework to conform to the TR6 arrangement where the PRV is position to the left hand side of the petrol tank to which the fitting instructions that come with the kit refer. 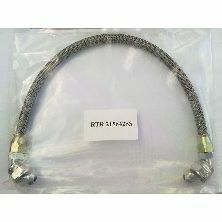 To avoid petrol smells in the boot a Teflon lined Stainless Steel braided hose will be required. We have two types which will suit most systems; 215642SS is the same length as the original (450mm) with a 90° union at both ends and RTR4048SS which is 648mm long with a straight union one end and a 90° union at the other. For the low ressure return (which is not usually a problem as it is low pressure) you can use RTR4036-1, 500mm required. MW emailed us after having us fit this new style PRV : I got the '6 the 175 miles back home ok with no howls when almost empty, no smell of fuel, starts well and runs as sweet as a nut. So, many thanks to you and the team for a job very well done. Revington TR information: PI petrol pressure gauge set, for accurate setting of PRV and fuel pump analysis. Includes hose, adapter and rubber shrouded gauge.